A full two weeks later & English Camp 2013 seems simultaneously to be a several months ago and just the other day. The Czech Trip puts me in a bubble for a couple of weeks as I focus on lessons, games and prayer. I don't think about work or St. Charles or my future; I truly am in a bubble with some of the best people in the world and I love it - but two weeks of it is good because the catch-up is grueling. The world keeps turning, bills and work need to be paid for and done, and television shows don't wait for me to get back. They keep going. And I found out **spoilers ahead** Bri is back on Masterchef and that Cris was Whodunnit. And here's what I did while in Czech. We really just had a ton of fun together. Those things I asked you to pray about? God demolished those barriers and answered prayers the day they were said. You could see God working and that is something quite remarkable but not at all surprising. I was given opportunities to get to know new students and share testimonies and spend more time with the kids I already knew and loved. We played card games, sang songs, did improv, drew ridiculous pictures and I laughed so hard my eyes were leaking. So, when I say that Czech was good I am also saying that I miss the people there a whole awful lot, so much so that my heart aches and I start looking at my bank account again and pondering just how much a plane ticket may be right now. These are my girls. Pictured left to right, my Astronaut Unicorns (you may have heard of us, we performed a pretty incredible version of Rumpelstiltskin that got rave reviews and a few eyebrow raises) : Paja (who spent the last year in Alabama and now loves Arby's and speaks English like a straight-up American now), Verča (has near perfect poise, can balance a liter of water on head in Prague metro), skip me , Míša (glorious Czech beauty that is rivaled only by the glory of her wit and creativity), Lucka (sings a wicked Adele cover with raw emotion but can dominate a slack line like Adele never could), and Bara (who knew more Spanish than I did and now has intense cowboy swagger that she channeled through being naturally awesome). This was my class for the week and we had heaps of good times. We talked about God, the world's problems, and girls who deserve the title "heifer." The answer is none but that doesn't make saying the word heifer any less funny. Some of my favorite snapshots of the campers. I could go into detailed explanations of why I love all of them but we'd be there a whole while longer. We stayed at Chata Muhu again which is where you should stay too if you ever find yourself in the area. Go on in, Frankie is friendly. We ate apricot kolaches & had a great bonfire at the end of camp. After camp, we returned to Prague and recuperated with some serious naps and some Chinese food. The Sunday after camp we had church together at Tyrannus Hall and then went into the city as usual. This year's top site was the Strahov Monastery where I saw two of the most beautiful libraries in the world. Look at these photographs. Jacob took these photographs. I wanted to touch all the books. There's a reason they don't let anyone IN the room. 1. Seeing Pavel, Renee & the Czech leadership team again and catching up with some of the Trča clan over some grilled burgers and paprika chips. 2. Seeing the famous Josh Krato again. We delivered Doritos & peanut butter and he led worship & songs like a champ every day while also delivering not one, two BUT THREE evening talks/sermons. 3. GLOBUS. It's basically a Czech Walmart but it is precious to us and we make field trips to it almost every day we were in the city. 4. Wanna see videos from our trip? My talented husband compiled videos at the end of each day at camp to recap on the all the fun we had each day. You can watch them all at that link - the videos labeled "Building Bridges." 5. My sweet girls made me one of the most heavenly cakes on the planet. My only regret of the trip: I couldn't take it back to the States with me. I would have eaten the whole thing. In conclusion, there really is no conclusion to this camp. There are English Club meetings throughout the year. Pavel, Josh & Renee still pour their love and attention into these kids. I keep up with them throughout the year until I get to see them again. 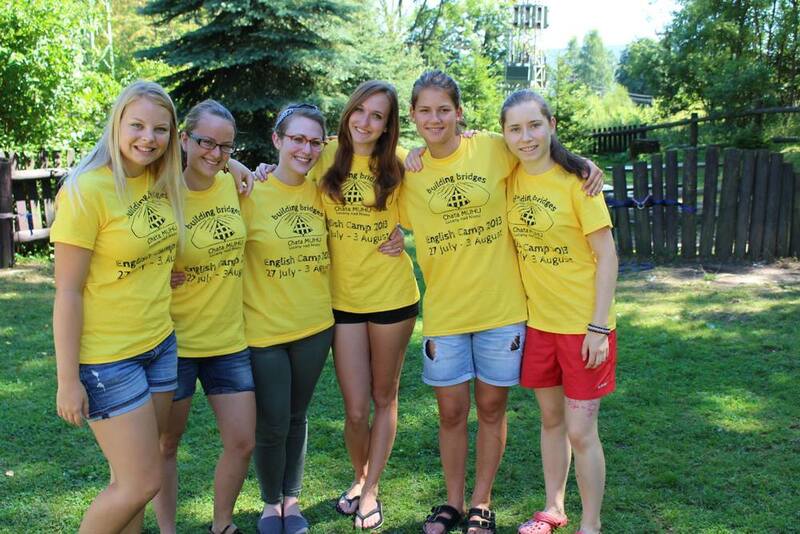 God doesn't stop working at the end of camp and He is still very present in the Czech Republic. I don't know about you, but I will continue to pray for God's work to be mighty and evident in Prague and beyond. We learned at camp that God is so aware of the pain and suffering throughout the world and in our hearts; we learned that this too shall be made right. We learned that ignoring the problem or becoming apathetic to others' pain is inexcusable because we can always help. In some small way, we can always help.